Words are my life. They are, of course, the way I make my living, but they mean so much more to me than that. I’m no postmodernist, but Umberto Eco’s joy in language is something that speaks to me – I challenge anyone with a love of words to read The Name of the Rose and not be struck dumb by it’s revelations. Language, with all of its complexities and contradictions, is truly a thing of beauty. It is not just the means by which we express ourselves; it also has a palpable effect on our thinking. Consider the term word processor – only an engineer could have come up with such an appalling appellation. I don’t want to process words, I want to write them down, one after the other, in things called sentences. Yes, I greatly appreciate the ability to edit as I work, to correct typos and move entire paragraphs around, but processing sounds too much like what goes on in sausage factories for my liking. Which Word Processor Should I Use? I’m not precious about it. After all, I’m a mere journalist, not a lofty writer, but there’s more to words than processing. Still, forget about the nomenclature for now – there is a more pressing matter to think about: Which word processor should I use? In truth, I can use any of them. If I really had to, I could write on my iPhone or the back of a napkin. I would just rather not. I may be a lowly hack, but I still have certain demands to make of my writing software. First of all, I want its native file format to be Rich Text (RTF) or something similarly open and universal. This requirement alone rules out Apple’s Pages, an otherwise excellent piece of software that is a joy to use. Secondly, I want decent type rendering and support for Mac OS X’s built-in text services, such as dictionary access. Surprisingly, this does rule out a few applications. For a start, it means most text editors are out of the picture – monospaced type? No thanks. Thirdly, I don’t want to be irritated with ridiculous features that I have no use for. All I want is a word count, a blank page, and some very basic formatting options. Good-bye Microsoft Word, OpenOffice, and NeoOffice. I haven’t done a mail merge since I was at school, and I’ll do my layout in Quark XPress or InDesign, thank you very much. Finally, and most nebulously, I want to be comfortable using it. For me, this means it must be “Mac-like”. Whatever that means…. I’ve been through all of the popular applications: Word and its open source cousins, ClarisWorks* back in the day, and Nisus Writer in many of its manifestations. None of them quite suited, so I travelled the byways of more obscure software. I’ve tried Bean, I’ve tried Jer’s Novel Writer, I’ve tried LightWayText, Mariner Write, Mellel, Scrivener, Ulysses, and more. I particularly love WriteRoom‘s simplicity, but it’s not ideal for all situations. 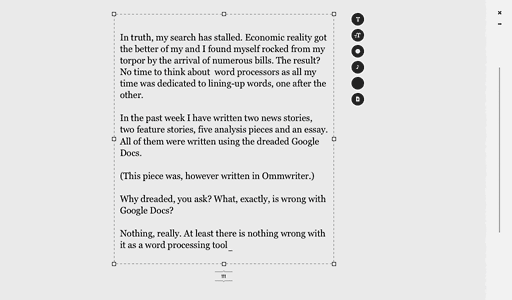 Ommwriter looks like nothing else. The latest big thing in Mac word processors is OmmWriter, a really strange application that plays ambient music as you type. It’s actually quite nice, but it doesn’t suit the temperament of a journalist. There’s something not quite right about writing a report on a terrible event while your computer makes soothing new-agey chirping noises. I know that I’m lying to myself. I know that the word processor is largely an irrelevance and that I should shut up, sit down, and get back to work putting one word after another, but this is about an aesthetic experience, and it turns out that such things matter to me. I’m actually considering developing my own word processor, just for me – though I’m sure I’ll never actually do it. This piece? I wrote it in Google Docs. Shame on me. * Publisher’s note: I still use AppleWorks (formerly known as ClarisWorks) daily. It is the word processor I use when I need to print output, just as Claris Home Page is my word processor when I need to write and edit for the Web. I also use the spreadsheet in AppleWorks. Although the last major revision (AppleWorks 6) was introduced in 2000, it works very well through Mac OS X 10.5 Leopard, the most recent version in use at Low End Mac headquarters. Update, March 2014: AppleWorks 6 works just fine with OS X 10.6 Snow Leopard as well. That said, because it was written for PowerPC Macs, it is not compatible with OS X 10.7 Lion and later. Since installing OS X 10.9 Mavericks on my Late 2008 Aluminum MacBook in October 2013, I have been migrating my word processing and spreadsheet files from AppleWorks running on my Mac mini with OS X 10.6 to free LibreOffice using the Microsoft Excel .xls file format as an intermediary. (LibreOffice can open AppleWorks word processing documents all by itself.) LibreOffice is not only a decent office suite compatible with Microsoft Office and many other file formats, it also saves in open source open document format. Recommended if you’re looking to avoid buying Microsoft Office. Pingback: chimac.net - Stuff worth knowing about – Want a summary of word processors for the Mac?